School officials consult several sources to determine weather and road conditions. They advise the superintendent, who makes the final decision to delay school starting times or close school. Read the district’s Emergency School Closure Procedures for more details. The superintendent makes the final decision for a change in normal operations on inclement weather days with public notification by 5:30 a.m. Exceptions may occur on days when weather or road conditions change rapidly during the morning hours. When will snow be cleared from schools? Faculty and public parking, including fire hydrants at schools without internal sprinkler systems and primary fire lanes. Following a snowstorm, student parking areas might not be plowed by the start of the school day. Students who normally drive to school should consider taking the bus or carpooling until student parking areas are cleared. On days when school is in session but conditions deteriorate over the course of the day, a decision about whether to continue after-school activities is usually made around 1 p.m. at the district level. That information is shared through the same communication channels that we make closures announcements. Our old website had a status message of "all schools open and on time" that would change when closures or delays were announced. But on those days we found that it could also give a false sense of security. While every effort is made to notify the public by 5:30 a.m., with changing conditions and dynamic emergency situations it's not always possible to meet that deadline. So if someone checks the website a few minutes before 5:30 a.m. or before an update is published and sees a status of "all schools open" they're getting inaccurate information. It’s better to assume schools are open and stay tuned in to district sources and the media for the latest updates in the event that the status changes. Many parents must find immediate child care or stay home from work for the day. In turn, the workforce across the municipality may be drastically reduced. When closures are limited to a single school or a small region, we use our Electronic Communication "robocall" system to call affected families and notify them about the closure. 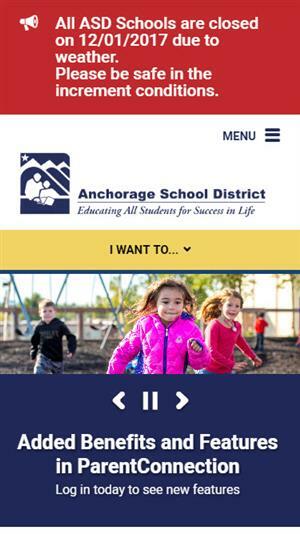 When all schools are closed, we use our regular communication tools for school closures that can get the word out quickly – the website, social media, and local television and radio stations. We do not use the "robocall" system for districtwide closures because there simply isn't enough time in the morning for our system to make it through the thousands of calls needed to reach everyone. Parents should keep an eye on those sources whenever they hear about poor weather conditions being forecast. Is school closed or delayed today? Notice of all closures and delays is posted on the ASD homepage. The absence of a notice indicates there are no delays or closures. Other outlets such as Facebook, Twitter and radio will also post closure information.